Separation of Faith Wins Again! 9th Contest Placement! The last thing I was expecting on Friday (which was also my birthday) was an envelope in the mail filled with a roll of award stickers to place on the covers of my Separation of Faith copies. Guess I’ve been a little distracted lately … 🙂 At any rate, when I saw the words “2011 Award Winner,” I immediately went in search of the specifics. And I soon learned that this amazing little novel has now placed as a Bronze winner in the 2011 Readers Favorite Awards in the category “Fiction–Realistic” (http://tinyurl.com/6hz6z77 ). (First place continues to be elusive–but still possible!) Every little bit of achievement helps along this winding path–and I love the bonus award stickers! Here’s a link directly to Amazon, in case anyone is interested in checking out Separation of Faith (available in hard cover, soft cover, and Kindle) in more detail– http://tinyurl.com/6hqwgrj . The story has an underlying mystery that takes the reader on a suspense-filled ride filled with illicit love, deception, hope, and redemption, with a plot twist no one ever sees coming! Please let me know if you decide to give the novel a try! Friday I developed a reaction (like a sunburn on my chest, neck, and cheeks) to one of the chemo drugs and was put on Benadryl for two days. That, of course, made me feel sleepy and weird, but otherwise okay. And I’m much better today. Supposedly, the first week after the chemo is when the most side effects are likely to take place, so I’m learning as I go which of those effects will be mine during the three weeks between each of the six treatments. Fortunately, my doctors seem to have remedies for most of the issues, and I’m hopeful that we won’t have to worry about too many of them. Yesterday I had planned to have my hair taken off, since I know the whole head’s worth will be gone shortly. But even though my daughter was with me in the hair salon where I’ve been going for eleven years, I wasn’t ready and couldn’t go through with the buzz cut. I did have two wigs shaped and styled, however, and they look absolutely fabulous! So that gave me a boost of confidence for when my hair is gone. My guess is that I’ll get my courage up for the buzz cut sometime this week. Once that happens, I’ll post a photo or two of me in my “new” hair, marking the first tangible point on this fresh journey-within-a-journey. Meanwhile, tomorrow I will return to my Write-A-Thon objectives and will update you on the progress shortly. Hope you’ve all had a wonderful weekend! 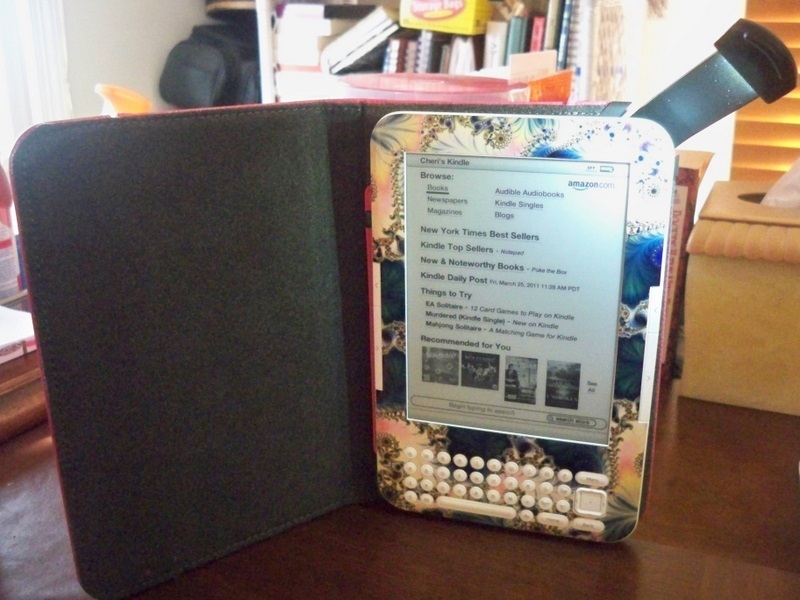 How My New Kindle Has Changed Me! This week the publishing industry sizzled with the news that bestselling author Barry Eisler turned down a half million dollar advance from St. Martin’s Press for his latest book, in lieu of self-publishing the book. “He did what?” you ask. Basically, and in a paraphrased nutshell, Eisler’s decision was based upon his belief that signing away his ebook publishing rights would, in the long run, cost him a lot more money than half a million. You can check out all of the details behind this rationale yourself through the above link. But the point that loomed beyond all of the resultant noise in the publishing community was the burgeoning significance of the ebook technology when paired with the increasing relevance and acceptance of high quality self-published work. 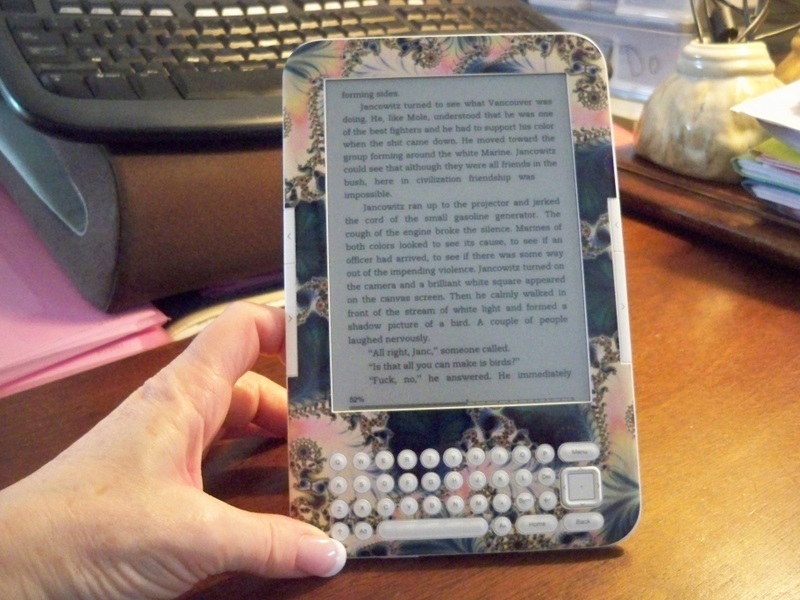 Of course, none of those advancements would be possible without ereaders (Kindle, Nook, etc. ), and that’s what I want to talk about for a minute this morning. Given the fact that I was a super-latecomer to the importance of the social media world and the associated tools and technology, there will be little surprise in hearing that I was also one of those writers/readers who felt umbilically connected to the physical elements of books. There was just “something” about the sensation of the cover and pages against my fingers, the smell of a book upon opening for the first time, the sense of satisfaction when placing a book I’d finished reading on my bookshelf, along with the dozens of others already crowded into that space. Please don’t misunderstand and think that there was some sort of block in my head against advancements in technology. 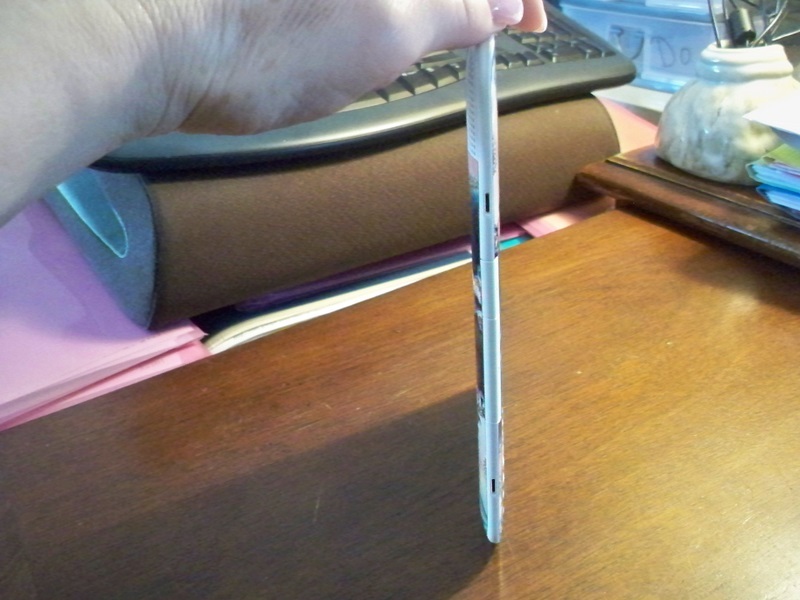 If you’ll search this blog site for “netbook,” you’ll come up with a number of posts where I wrote about the value of my “mini” and how the small size and portability enabled me to complete my second novel several months sooner than I’d anticipated. 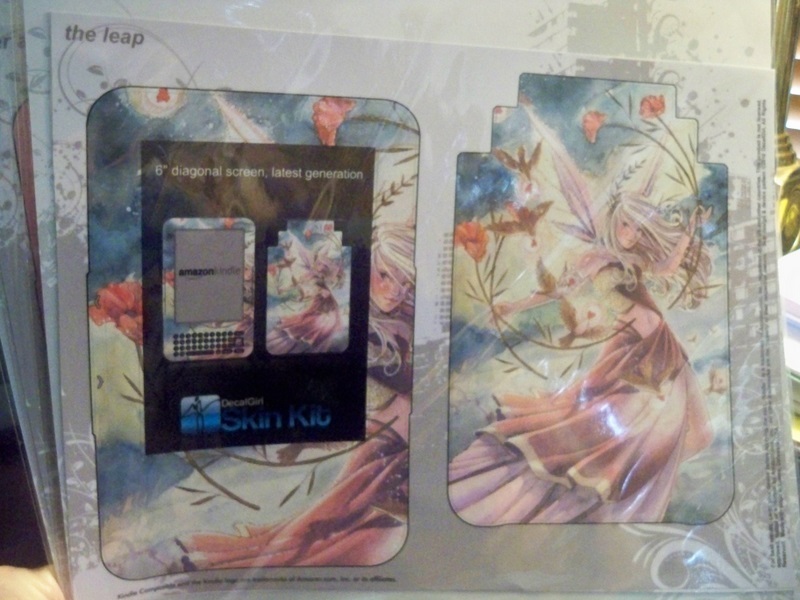 And last Christmas, when I received the glorious gift of an iPad, I thought I’d surely arrived in heaven. I also thought I’d solved the ereader issue with the iPad after acquiring the Kindle app in conjunction with the iPad’s own bookshelf. What I would soon learn, however, is that the glory of the iPad is that it’s actually a full computer in a tiny, relatively inexpensive package. 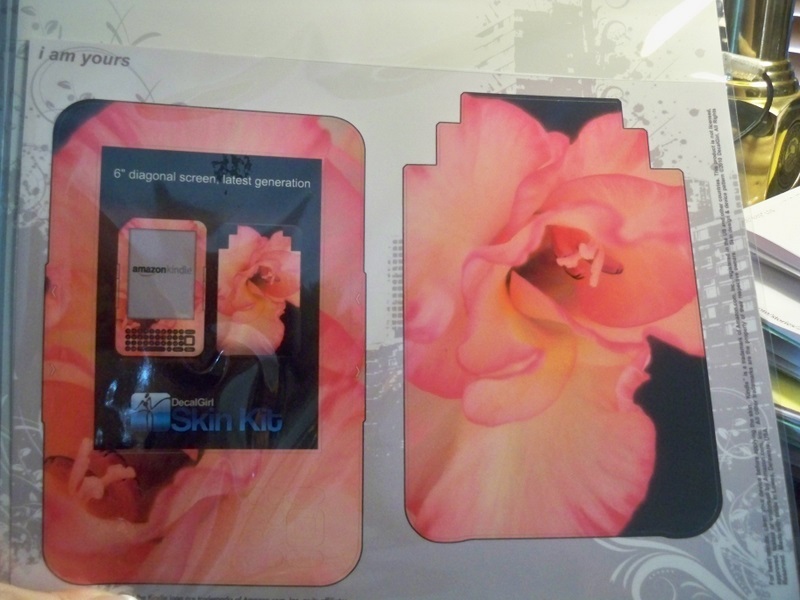 But it’s really quite large–heavy and combersome–when the screen is being used to read a book. Consequently, when I (an author of two novels struggling to reach readers) was asked if I owned a Kindle (or some other ereader), my typical response was, “No I don’t, and I doubt that I ever will.” But I found myself growing increasingly uncomfortable with that answer once both of my novels became available on Kindle and the rest of the ereader options–and then especially ill at ease during a speaking engagement recently when several individuals in the audience began asking operational questions about the Kindle. Many in that group believed that they had to own a computer in order to have a Kindle, and thank God I at least knew that wasn’t true. But beyond that point, I was an idiot. 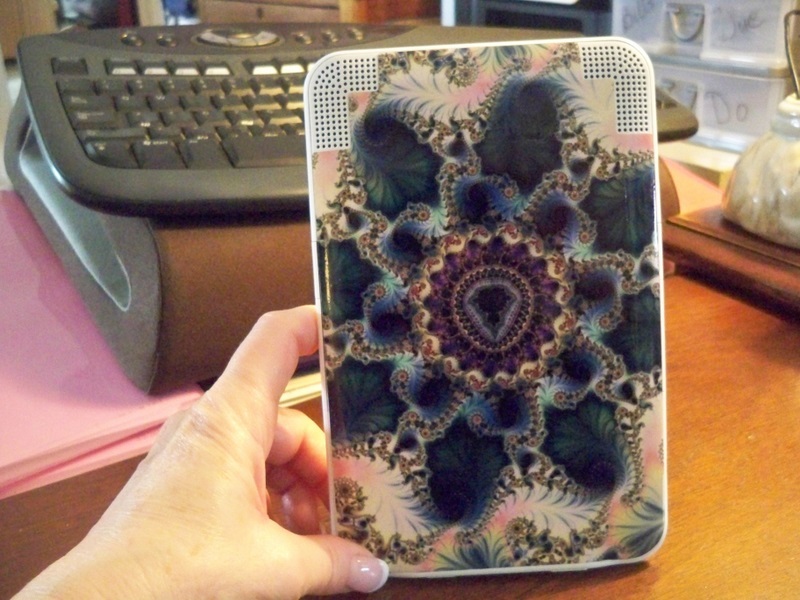 And then, within a week of receiving my Kindle, an amazing thing happened. I was converted as a reader. My resolute need for the tactile experience of feeling the paper as the pages turned was replaced by the fact that I was reading more. My tiny little Kindle fits in every handbag I own, without taking up space or adding any noticeable weight (at a mere 8.7 ounces). After needing an extra bag to lug around the mega novel I’m currently reading (Matterhorn by Karl Marlantes–nearly 600 pages) while sitting in waiting rooms for a series of doctor appointments recently, I ordered that same novel for my Kindle–ordered and paid for the book right on my Kindle, and within a matter of seconds, the entire 600 pages had been downloaded and were ready to read. Now, a week later, I’ve read 67% of the book (according to my Kindle tracker). And … I can read with one hand–that’s holding the Kindle and turning the pages, all with one hand–while scarcely feeling as if I’m holding anything at all. There’s no “power up” time. Just flip the switch to “wake up” the Kindle, and there’s your book. The pages turn with the gentle press of the page-turning “bar.” And if you turn the wifi off (which you don’t need to have on in the first place, unless you’re buying something else from the Kindle Store), the battery charge will last for an entire month. For some reason, I also seem to be reading faster. I don’t know if that’s because the font size can be adjusted up or down, or because reading has just become so completely effortless. But the number of words I’m reading per minute is definitely on the rise. 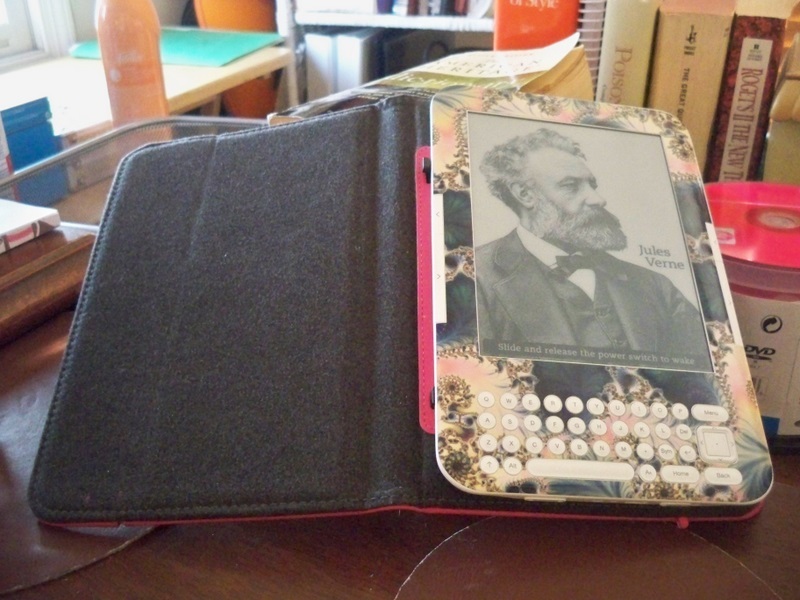 As sort of a shallow sidebar topic, there are all sorts of fun and extremely inexpensive accessories for the Kindle (and other ereaders) that allow each of us to personalize our reading devices. I fell for the Kindle cover with the built-in reading light. 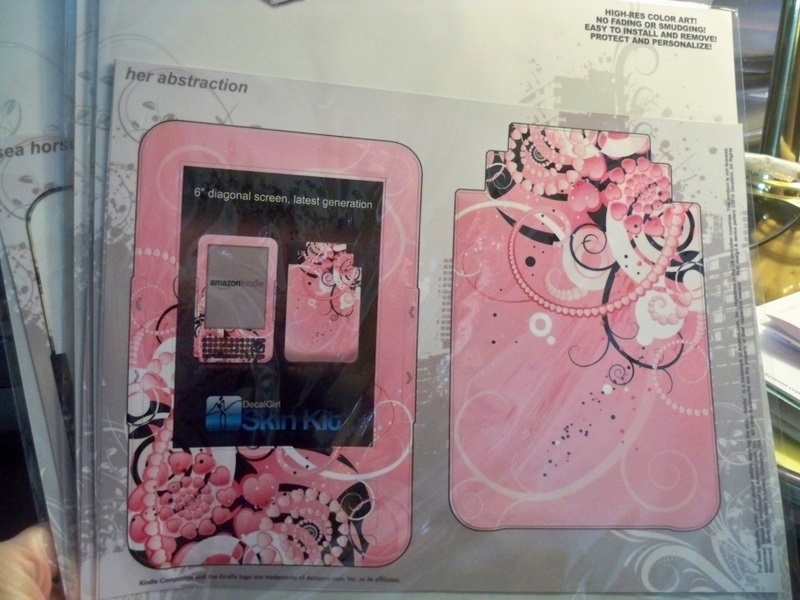 And the “bling girl” in me went absolutely crazy for the protective and decorative “skins” offered by a company called DecalGirl. 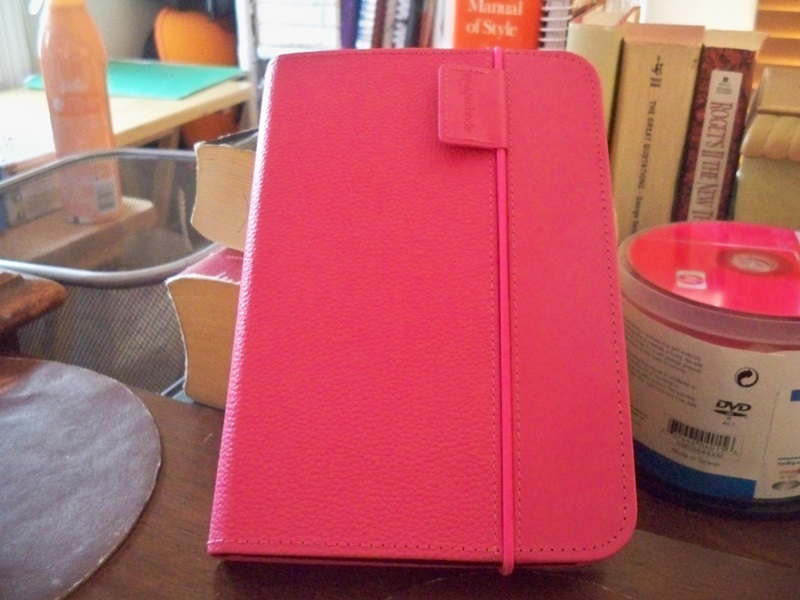 My Kindle is white, but I’ve dressed things up, as you’ll see in the pictures included in this post. The “skins” are easily peeled off and saved for reuse to enable variety, and they really do add a lot of pizzazz, if you’re into that sort of thing. The most important part of the experience, though, is the reading. And because of my Kindle, I’m doing more of that at a faster pace than ever before in my life. Gone with the Wind and hundreds of other books that same size can be with me at all times, enabling me to read whenever there’s even a five or ten minute period of dead time in a day. Real books–the way they look, feel, and smell–will always hold a special place in my life and heart. And my copies of many classics will remain on my bookshelves forever. But as a reader–and especially as a writer–I’m more excited about what I’m reading (the number of books I can get through in a month) than I ever dreamed I would be. For once, I’ll actually be able to finish bestsellers while they’re still current. And no less important to me is the fact that the more I’m able to read, the more my own writing will continue to improve. 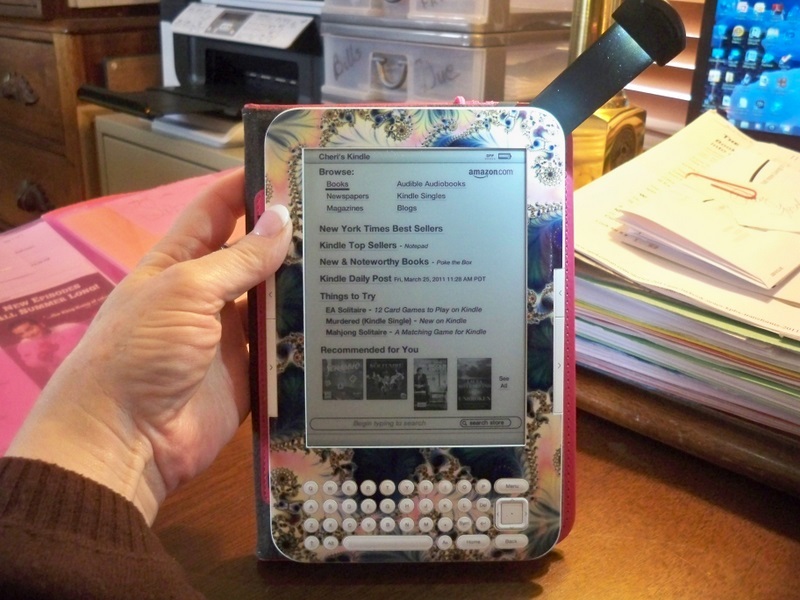 So, if you’re one of those who’s starting to think about jumping into the world of ereaders, fear not! “Real” books will always be there for you to savor, no matter what you might hear being predicted. But if you’re looking for the sheer power and ability to get a lot of reading done, way beyond what you’re normally able to accomplish, go ahead and make the leap! You won’t believe how much fun the reading world is in here! P.S. (after the original post): One of my blogging buddies (Jacqui at www.worddreams.wordpress.com) asked me about the setup, wondering if getting up and running is complicated. The answer is that the whole process is quite simple, and there are very few steps involved. A very small booklet is enclosed in the Kindle package that introduces you to the operational buttons and the basics. And the list of Menu options on the Kindle screen is not very long. Exporing each one will lead you into the rest of the things you can do with your new little miracle device. The most important part of the setup, though–buying and downloading your first book to read–will only take about two minutes–maybe even only one! You’ll spend most of your time browsing through the Kindle Store, going absolutely nuts over what is now available to you! If you decide to enter the Kindle world, please let me know. I’d love to hear about your experience(s)!